THERE IS ONE PERSON at the www.itexaminer.com who helps to keep things moving and without whom our entire infrastructure would grind to a halt. This is Madhu, really a force of nature, who works behind the scenes in a consistently positive way and who could, quite rightly, be called the VP of Operations at our Bengaluru magazine in Ole Indiranagar. 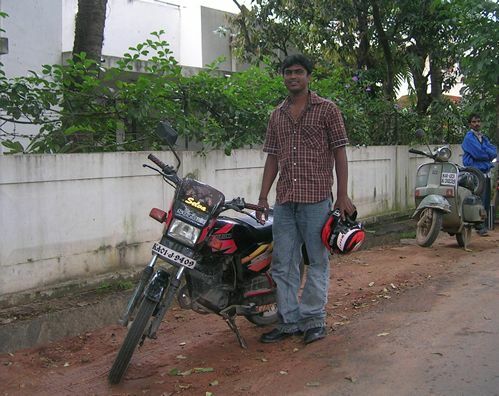 Madhu, pictured below, has just delivered yours truly to my apartment on the back of his motorcycle, and has made sure the wi-fi works, despite the “copper” from Airtel we described before. It is an interesting ride from the Examiner office to the Examiner apartment, but we had no fears of accidents on the way. This entry was posted in Uncategorized and tagged Airtel, Bengaluru, Indiranagar, IT Examiner, Madhu. Bookmark the permalink. Mikeji, now you know why foreigners come to India in search of spirituality. Many famous atheists started believing in God after crossing our roads safely!